pasta is one of my favorite dishes (gluten free pasta now that i have to be careful because of my Celiac's!). it's warm, comforting, and packed with a variety of complex flavors and tastes. however, there are a few places where pasta can manuever itself into "unhealthy" territory. 1. canned spaghetti sauces are often times full of added sugars (which is not healthy) and 2. pasta is usually made with white flour...which poses problems even for folks who can eat gluten. however - a beautiful pasta does't have to be unhealthy at all. making pasta for my family is a regular occurrence in our household, but i do it the healthy way... using all natural ingredients, i even make my own red sauce! it's one of my favorite things to make and i wanted to share it with you guys. i hope you enjoy it! 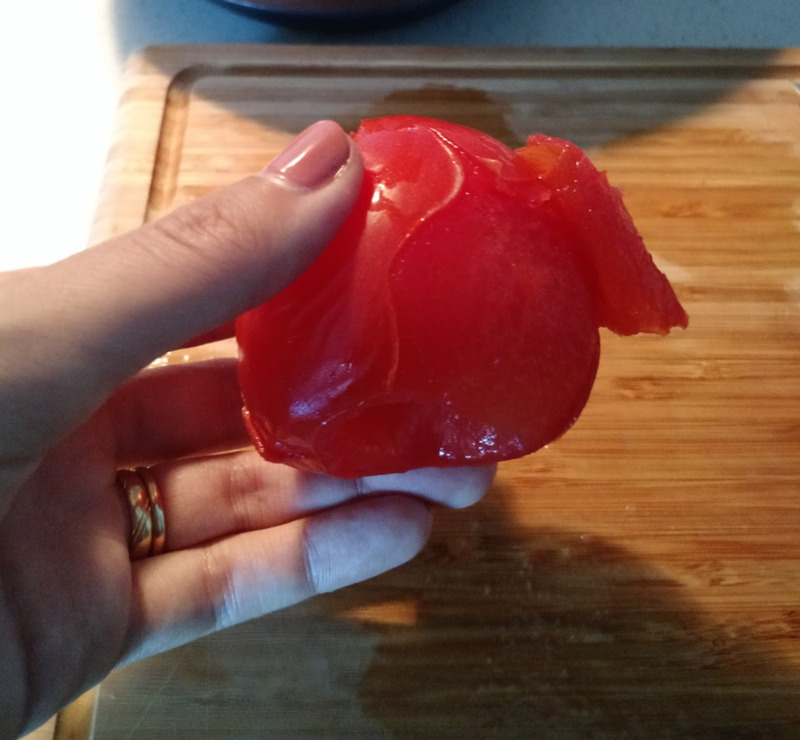 step 2: place the tomatoes in boiling water for about 5 minutes, or until you start seeing the skin separating from the fruit (as seen below). step 3: remove tomatoes from boiling water and place into an ice bath to cool them down before handling. (you can drain the boiling water from the pan, you don't need it anymore). Cool tomatoes for a few minutes, or until they are comfortable to hold in your hand. step 4: peel all of the flesh from the tomatoes. step 5: dice the peeled tomatoes (no precision needed) and put them back in the pan (alone, no water or anything else!) Add salt and spices to tomatoes. be very generous with the spices, as it will only increase the flavor of your sauce! **if you are making more sauce than you need (aka you want to jar or can some), add the lemon juice here for preservation purposes. step 6: simmer the tomatoes/spices on the stove for anywhere from 20 minutes - 60 minutes (the longer you simmer, the more it will break down). the consistancy should look like this when your done... but you can simmer more or less depending on what you like. remove sauce from the heat and cool while you prepare the rest of the dish. homemade red sauce that you just made! step 1: boil pasta noodles with a dash of salt in the water. remove from heat and drain when they are ALMOST done, but not quite. rinse with cool water and set aside. step 2: dice garlic and onion. sweat them in a pan with a dash of olive oil on medium-medium/high heat until fragrant. step 3: add minced meat to pan with herbs and spices (GENEROUS amounts of rosemary, basil, and oregano..be very GENEROUS with your spices!!!!!). brown the meat and mix it with garlic and onions. step 4: slice mushrooms and add to mixture. step 6: add a large sprinkle of salt. the salt helps the flavor of the tomato sauce really shine. simmer this mixture for 3-5 minutes. step 7: add cooled pasta directly into the sauce in the pan, and mix well. it is crucial that you add the pasta in WITH the sauce while cooking! step 8: sprinkle parmesan cheese over everything, fold into the pasta for about 1 min. remove pasta from heat, serve immediately! sprinkle additional parmesan cheese on as desired!